A lot of customers are climbing up the walls at the moment after the Sears accidentally prices the Apple iPad 2 at $69 (Â£43), normally priced at $499.99 for the 16GB WiFi version. Of course after seeing the iPad 2 priced at only $69 (Â£43) customers jumped on it as soon as possible to bag them a bargain, this is one best tablet PCs on the market and of course with a price tag so low you would be crazy not to buy it. 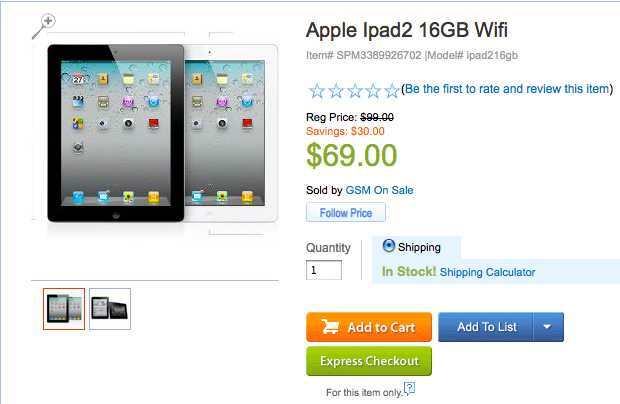 This stunning but wrong deal was advertised on Sears third-party resellers “GSM On Sale”, but the mistake was spotted and was soon taken down, but not before customers placed their orders for the very cheap Apple iPad 2. This means that all of those that purchased the iPad 2 would be getting a full refund, personally I myself have been onto a certain electronics store (not naming them) and saw a product for half the retail price, I went up to the cashier and they said that the product has marked up wrong and said I would have to pay the full price. Well, I was not having any of it and asked to speak to the manager, I said as a customer I was led to believe this low price was the price I could purchase the product and I expect to pay this low price. After a few words exchange I got the product at the low price, it is not a customers fault if it was falsely advertised and should obtain it for the marker up price. Sears said that they would credit customers’ accounts with the amount they paid for the Apple iPad 2, customers on the Sears Facebook wall are not very happy, and who can blame them. Do you think Sears should honour the low price offer to those that purchased? We would love for you to answer the question above by using our poll system below, click the relevant field. You can also leave a comment if you wish, hope to hear from you all soon. The truth is if that is the price listed then that is the price you pay. Period. If the people were in certain states like New York, the retailer would have to honor the price, begrudgingly. The laws are different from state to state. But I know in NY, mistake or not, if the transaction was completed, they must honor it.